Prezi is a wonderful alternative to which programs? Which version of Prezi should you sign up for? What option do you choose if you do not want to use a template that is already created? The menu on the left shows _______? 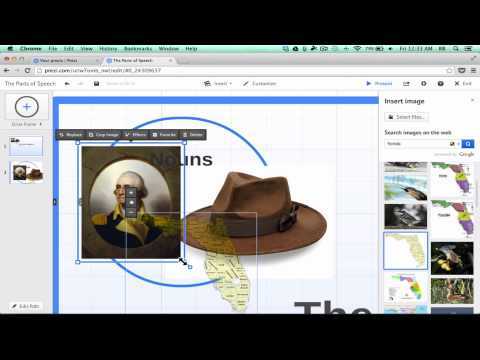 How do I move closer to and further from the Canvas in Prezi? Does your Prezi automatically save? How do I change the circle frame? Is there a way to resize the text box? How can I add a second zoom? Can I place one frame instead another? How do I know the order of the frames? How do I add a picture to my Prezi? Which pictures can I use on Prezi? How can I move images from front to back in Prezi? Can I reorder frames once they have been made in the path? How do I animate objects in the frame? Why do hyperlinks not work when you enter them in Prezi? If you are in edit mode, hyperlinks will not work. Hyperlinks must be refrigerated before use. They do work. You just have to hold your mouth a certain way. Is it appropriate to use YouTube in a Prezi? No, I know I won't be able to stay off terrible music. If I want to add the same frame to all my prezis, where should I put it? Can you convert a Powerpoint to a Prezi? How do I customize my theme in prezi? Which button do I choose to show my prezi in class?